The Sugar Man Swamp is about to be developed into an Alligator Wrestling theme park, there are wild hogs on the way through town and 11 year old Chap Braeburn is about to lose his home and his heritage. 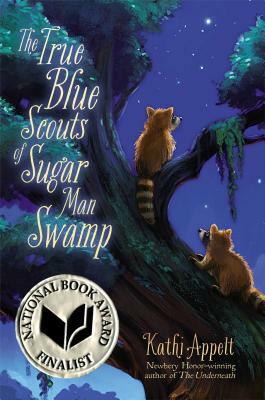 In short, the swamp is under attack and it's up to the Sugar Man Scouts (who are all raccoons) to alert the Sugar Man, so he can put it right. Several story lines are woven together in this funny and exciting book, it doesn't seem possible that it will all work out OK in the end, even if the mythical Sugar Man ever does wake up. A great book to read aloud to elementary aged children, with enough content and good words to keep middle school kids interested too.